Planning to get the train from Rome to Florence? Want to know if you should purchase your tickets in advance? Where to buy them? Which train stations to use? I've got all the answers right here! Two of the must-see cities in Italy are Rome and Florence. I find people usually go to both during a visit to Italy. The cities are so close that you can easily leave Rome after breakfast and still have a full day in Florence. Typically people visiting Italy from abroad fly into Rome, since it has such a big international airport, and there are so many options for flights. They (hopefully) will spend some time exploring Rome, and then will head to Florence as their next destination. The fastest way to get from Rome to Florence is by taking a high-speed train from Rome Termini or Tiburtina station into Florence Santa Maria Novella Station. The fast trains take 1.5 hours to get from central Rome to central Florence. The fast trains go around every 20-30 minutes all day from about 6am-9pm. This page is specifically about taking the train from Rome to Florence, as opposed to driving, flying or taking the bus. Why? The trains in Italy are really well-run and punctual - at least the fast trains are. There is an old joke about Mussolini that at least he made the trains run on time...I am not sure if that part is true, but the high-speed trains run really well today. Both Rome and Florence have very central railway stations, and there are frequent, well-run, comfortable trains between them. It's also incredibly fast, taking only 1.5 hrs to go between Rome and Florence. Any other method of going between Rome and Florence will take you nearly twice as long. If you want to know about other ways to get from Rome to Florence, jump to this section. Over the years we've helped thousands of our hotel guests with their plans to get to Florence from Rome, whether as a day trip or as their next destination after Rome. The different train options boil down to taking a Trenitalia train, fast or slow, or an Italo train. And then, it's about which Rome train station to use, what time you want to go, and the cost. If you use the Trenitalia or Italo websites to view schedules or book your tickets, you will need to use the Italian places names even if you use the English version of their respective websites. For Rome, select Roma - tutte le stazioni or just "Roma" to see all the stations), and for Florence, select Firenze - tutte le stazioni, although you should try to go to Santa Maria Novella, which is the main central train station in Florence. If you use a third party travel agency website, you may use the English versions of the place names, Rome and Florence. More about this below. Trenitalia is the state-run train company, and for many years was the only option for taking long-distance trains in Italy. Now there is also Italo, a new competitor. See below. The Trenitalia website is actually pretty easy to use, and gives you a lot of options for times and types of trains. You will have to create a login with them if you want to buy tickets on their site. To view Trenitalia train schedules and fares, and purchase tickets online, visit the Trenitalia website. For English, click the flag in the top right corner. In the above screenshot, which shows a sample of all types of trains and stations from Rome to Florence, you can see there are a lot of options. Note that the freccia trains only take 1.5 hours, while the Regionale and Intercity trains take 3-4 hours to get to Florence from Rome. As for the prices, you can see that the regional and intercity trains are around 20€ one way. But even with only two days' notice (in low/mid season), you can get close to that price for a fast train. Why do the prices say "starting from"? Depending on how far in advance you book (i.e. availability), you can get "economy" or even "super economy" tickets. Sometimes there are really good specials for going back and forth same day. The difference between first and second class is mostly legroom and (possibly) crowds. First class can be quieter since there are often fewer people. On the frecciarossa trains, there are even "quiet" cars, with complimentary wifi, really great if you are going farther like to Milan or Venice. For taking the train from Rome to Florence, I don't think it's worth spending the extra money for those amenities. In 2012, Italo began operations and now competes with Trenitalia, offering more limited routes. They supposedly offer lower fares but in my research looking up fares for taking the train from Rome to Florence from Rome, I've found it depends on how far in advance you book and the times you want to go. It's all about supply and demand! To view Italo train schedules and fares, and purchase tickets online, visit the Italo website. For English, click the down arrow in the top right corner. Italo only has high-speed trains, which means it will take you 1.5 hours or less to get by train from Rome to Florence with them. The Intercity and Regional trains take longer: 3-4 hours to go from Rome to Florence, because they travel more slowly and makes lots of stops. If you are buying tickets on the same day of travel, you will usually find that the regional train costs about half the price of the fast trains (around 20€ vs around 40€ one way), but takes almost twice as long...so you'll need to decide if time or cost is more important to you. Termini used to be the only really major train station in Rome, considered the main station. Tiburtina station is the "new" central station in Rome, meant to be an additional main station to Termini. In the end, even though Tiburtina is much newer and even nicer than Termini station, and even though there are lots of trains coming and going from Tiburtina, Termini is still often considered the main station in Rome. Some trains leave only from Termini or only from Tiburtina, so it might be a matter of schedule and price. If you have a rail pass, and want to use it to take the fast train to Florence, you will need to pay an additional 10€ fee to get a reservation. You can do this online or at the kiosks at the station. To book your tickets for the train from Rome to Florence, you can do it on the day of travel, right at the train station at the kiosks there; book the tickets in advance through one of the two train vendors, Trenitalia or Italo; or, you can go to a travel agency to buy your tickets. There are very easy-to-use kiosks all around Termini and Tiburtina stations (and in Florence too.) First you just tap the screen to select your language, and the rest is very straight-forward. Just follow the prompts. You can pay with cash or credit card. Lately there has been a bit of a problem with gypsies staking out the kiosks and trying to shake down the kiosk-users. Using an agency means paying a small fee (like 2-3 Euros per ticket), but the advantage is that you have a middle-person to assist you if you have any problems with re-scheduling or otherwise. And with an agent, whether online or human, you can see and understand the ticket options and purchase process more easily in English. There are a lot of travel agencies all around Rome, including inside the Termini train station. You can also use an online train ticket agency such as Rail Europe. There you can see all the different options including trains with Italo, Trenitalia and the various fast vs. regional and Intercity trains. You can usually buy your train tickets on the day of travel, right at the handy kiosks inside Termini or Tiburtina station (and in the Florence station, if you are coming back to Rome.) This can be nice if you are not sure what day or what time you want to go. However, in very high season, you may find limited seat availability on the train you want. And, if you book in advance, you may find discounted and even super-discounted fares. When you take a regional or Intercity train, you need to validate your tickets in the yellow or green box, which you will find at the head of each track. You do NOT need to validate any tickets for the high-speed trains, as you have a specific seat number, and the ticket is ONLY good for the date and time indicated on the ticket. I'd hope you would want to spend time in Rome (especially since this is my city and I love it and think sometimes it gets overlooked), but I realize sometimes people just don't have the time. To take the train from Fiumicino directly from Florence, follow the signs in Fiumicino airport for the train station (the same one with the Leonardo Express trains that take you from Fiumicino into Rome.) You may purchase your tickets right there. The train trip from Fiumicino to Florence is 2 hours and 15 minutes. Rates start at around 25€. BIG CAVEAT: There are only 2-3 of these trains per day. 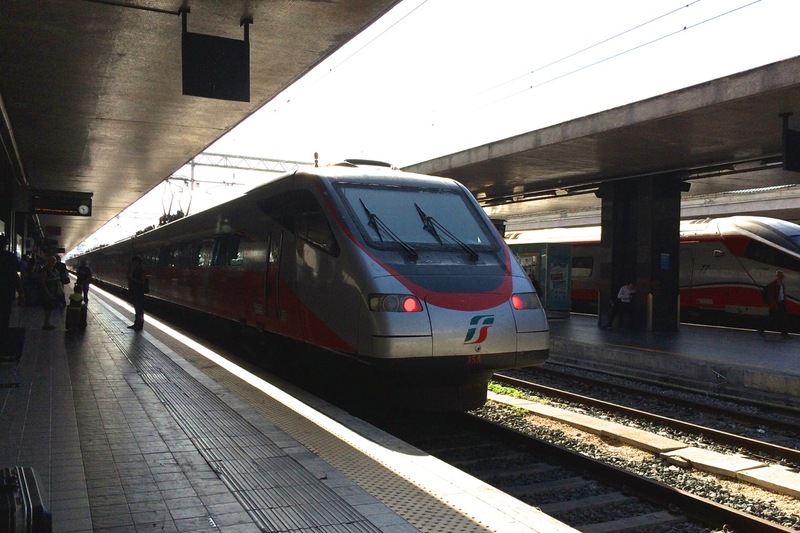 You will find so many more options if you take the Leonardo Express train from Fiumicino into Rome's Termini station, and then get one of the frequent fast trains from Termini to Florence. The train station in Florence is just at the edge of the city center in Florence. To get into the city center takes about 10-15 minutes walking. Walk straight out of the train station either directly in front of you, or just a little to your left, and cross over the big streets. You will almost immediately find yourself right in town. To get a free tourist map of Florence, walk straight outside the train station, and cross over the multiple streets in front of you. On the other side you will see the Official Florence Tourist Board, where you can get a map for free. Inside the Florence train station, there are plenty of "tourist information points", but they are for profit, and do not give away free maps, but rather sell them. While I'd strongly recommend taking the train from Rome to Florence, for ease and speed, if you prefer not to, you do have other options. This is probably the most popular way to get from Rome to Florence when not taking the train. We often get this question about how to drive from Rome to Florence, and I will say we have often talked people out of it. If you are driving around Italy and already have a car, or, if your plan is to leave Rome and visit other country spots before you go to Florence, perhaps spending time in an agriturismo somewhere in Tuscany, then of course having a car makes sense. But if you are going straight from Rome to Florence, the best bet is to take the train. If you will also visit the countryside after Florence, then rent the car in Florence when you are finished with your visit there. It is never a good idea to have a car inside either Rome or Florence. First of all, we have congested and often pedestrian-only city centers. Often there are restrictions about where to drive and where to park and you risk hefty fines for going into the restricted zones. And then there is getting lost, and dealing with often-changing road directions that may not have been updated in your gps. You have to take into consideration the tolls on the Autostrada between Rome and Florence. Tolls will run you around 20€. Fuel in Italy costs a lot more than it does in the US or Canada. Plan about 35€ in fuel costs just to drive from Rome to Florence without major detours. Renting a car while in Europe is much more expensive than if you rent it from home. Rome has two airports, and Florence has one. The flight between the two is about 1 hour. You also need to consider cost, plus the time it takes to get to the Rome airport, and time at the airport. Then once in Florence, you will have to get into the city. All of this including the flight will take close to 4-5 hours. There are about 2 trips a day, costing around 20€ one way, and taking almost 4 hours. You will go slowly and have plenty of stops so a lot of chances to really soak up the country side as you drive along. The buses leave from Tiburtina station in Rome. Although I've been a tourist in Florence a few times, I am not a Florence expert. But I do have friends there. One of my favorite Florence bloggers is Georgette Jupe, a "Tuscan Texan", who really has her finger on the pulse of life in Florence. She has a great page you can start with, all about Useful Information About Florence. Georgette offers some excellent suggestions about where to stay, what to do, where and what to eat in Florence. Another friend of mine, Courtney Mundy, and her Italian husband Tomaso, rent out a wonderful apartment smack in the center of Florence. Return to the top of Train from Rome to Florence.